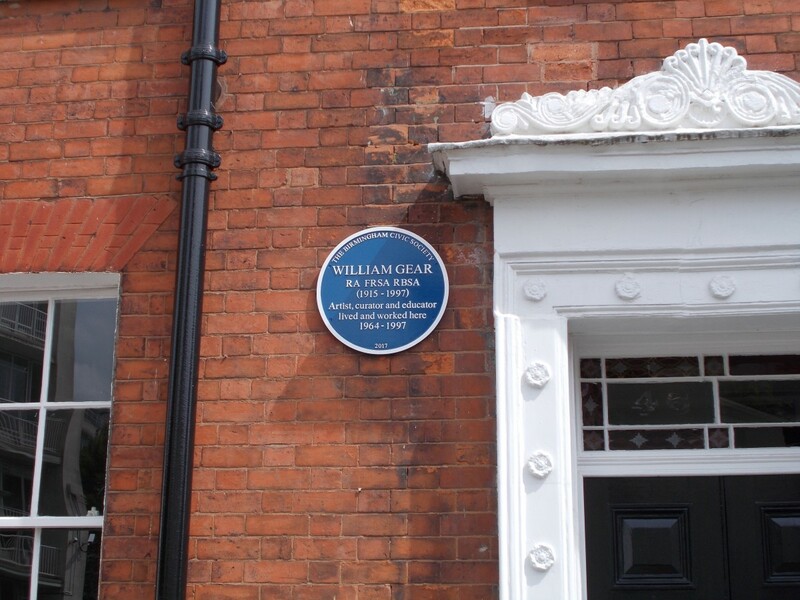 The Redfern Gallery is pleased to announce that a blue plaque has recently been erected by English Heritage at the former home of William Gear. Gear moved to 46 George Road in Edgbaston in 1964, after resigning from his role as curator of the Towner Gallery in Eastbourne to take up the new position of Head of Fine Art at Birmingham College of Arts and Crafts. He retired from teaching in 1975, but continued living in the same house until his death in 1997. While in Birmingham he became involved with the Royal Birmingham Society of Artists, and was elected an Honorary Member in 1966. A large-scale retrospective was mounted at the RBSA in 1976. Throughout his time in Birmingham, Gear was committed to promoting contemporary art in the area, especially with Birmingham Museum and Art Gallery, and in 1993 he made a proposal for the establishment of a museum of modern art in the city. He exhibited frequently at local venues such as the Midlands Arts Centre, as well as The Ikon Gallery.